I still do knit sometimes, don’t worry. I even finished a pair of socks this week! 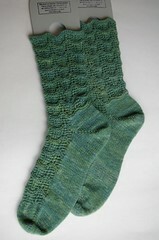 I finally finished the Ripples socks from November’s Sockamania pattern. They’re intended for my friend Kelly, I hope they fit her! They might be a bit tight around the ankles but I gave them a good soak and I think they might have stretched out a bit. I wont know for a few weeks if they do fit her as I need to mail her the socks and she’s on vacation at the moment. 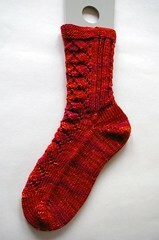 I also finished another sock, my first Red Dwaf sock in HandMaiden Casbah Sangria. The pattern really was a lot of fun and I had them knit in no time at all. I started knitting again on my other Red Dwarf sock, the one in Schaefer Lola. I’ve reached the leg now and I should have it done in a few days. 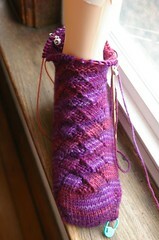 This sock is destined for my May Day Sock Swap pal. I hope she likes the color! After spending more time sewing on my sewing machine, I realized that it really didn’t work very well and that I needed to buy myself another one. I am in the process of destashing quite a bit of yarn to pay for it. I have some new yarns listed on my destash page . Let me know if something strikes your fancy! Yay socks! I love the colors in that Schaefer yarn. I’m sure your sock pal will too. Ooh so what kind of sewing machine are you thinking about??? Okay, I need to get some of that Sangria for myself. I love how it looks knit up. Love the sock! Beautiful socks! I wanna be your new sock pal. 😉 I’ll take any of them..I’m not picky. oohhh girl your socks are so freaking prettyy!!! I love the red dwarf socks. Both of them! The colors are so rich. I’ve had problems with my old machine, it was a Singer. The sewing machine guy who fixed it told me that it was never properly lubricated. And it didn’t help that there was a tun of fuzz in it. So the gears where grinding on each other. After he lubed the machine up it worked well. A year later I bought a Lady Kenmore and I love it. Its nice to me. Now if I could only sew…. I always make sure to give it a bit of sewing machine old every now and then. Good luck — I hope you find the sewing machine of your dreams! YEA! Ripples…beautiful! Lucky me… Talk to you very soon!